Mapping the surface features of farflung alien planets is a tough task, as a simple example illustrates. Rapidly spin a globe with black and white regions painted evenly on its surface. These distinct sections fade to a mottled grey when seen in certain orientations. Cowan and his colleagues investigate that problem and several others in a recently completed study that, they say, could aid scientists' efforts to map out the surfaces of exoplanets in the coming years. Alien planets appear very tiny, even in the most powerful telescopes astronomers use. Many worlds are only visible through their effects on their host stars — either by changing these stars' spin slightly, or altering their brightness when passing in front of them. As a result, few pictures of alien planets exist. Although astronomers first spotted a world beyond our solar system in 1992, it wasn’t until 2010 that the first direct image of an alien planet was confirmed. Even then, it was only a small dot. 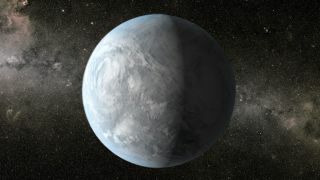 As our understanding of extrasolar planetary systems increases, however, Cowan’s team is developing techniques to learn more about alien worlds by studying their reflected light, as well as their heat signatures. From a distance, light coming from a planet can reveal dark oceans and brighter continents. The light changes as clouds pass across the surface, hinting at things such as wind speed. In infrared wavelengths, other information emerges: seasonal variations, planetary tilt and, possibly, hints to the underlying terrain. For example, Cowan said, "tropical rainforests look dark from space because there are clouds in the way." Evenly distributed dark and light regions on a planet tend to blend into a uniform light curve as the planet spins. Cowan’s team created a series of simple maps and then modeled what they would look like on a spinning planet, as seen from different orientations. Generally the maps focus on very large regions with high contrast, similar to what would be visible from a telescope peering at the world from many light-years away. If astronomers were looking at Earth from this scale, they might be able to see Eurasia, the Pacific Ocean and the Atlantic Ocean, Cowan said. Infrared maps might show the difference between the day side and night side of the planet. "Really coarse stuff," Cowan acknowledged — but a start. The aim is to put these maps, and the analyzed light curves, in a database that astronomers can access. As a next step, they could then be applied to planets visible in telescopes today. "Hot Jupiters" are a likely target for infrared studies, Cowan said, referring to gas giants that are close to their parent star. Astronomers have detected atmospheres around these planets but have spotted no surface features yet. It's possible that astronomers could map out rough surface features on hot Jupiters by studying temperature differences from afar. "What you’re hoping to measure there is the fact that this hot Jupiter has different temperatures in different locations. You’d make a climate map, a temperature map from far away," Cowan said. Mapping planets in visible light would be even more challenging. The star’s brightness overwhelms the telescope and makes it difficult to see any planetary dots nearby — Earth-like alien planets included. Cowan said there are two surveys coming online, however, that are aiming to take more pictures of alien planets: the European Southern Observatory’s SPHERE (Spectro-Polarimetric High-contrast Exoplanet REsearch) instrument for the Very Large Telescope in Chile, and the Gemini Project Imager that will use adaptive optics on the Gemini South Telescope (also in Chile). "Those sorts of experiments should detect a whole bunch more of these directly imaged planets," including worlds with relatively distant orbits, Cowan said. "The difference between them and the [hot] Jupiters is they’re much further away from their star and they orbit slowly," he added. "In that case, you can’t really stare at them for a full orbit, as it would take decades. So we’re hoping the planet is spinning [rapidly] on an axis and as it spins around, its brightness might change." The new study has been submitted to the Monthly Notices of the Royal Astronomical Society and is currently available on the prepublishing site Arxiv. Other participating institutions include the University of Chile and the Center for Theoretical Physics, Luminy Campus in Marseille, France.